Last night I wrote about “Beliefism” which for some people, is living as a parasite off its co-joined twin, “Bibleism”. 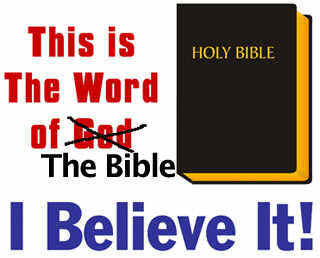 Now, let me be clear, I believe in the authority of scripture, I believe that it is the inspired word of God, I have and continue to study it. However, the truth of the matter is that there is a lot of abuse which goes on around the bible. So many people become “Beliefists” because they cannot see the difference between their interpretation of scriptures and scripture itself. There is also a tendency to insist that we cannot understand any part of scripture as being mythological or allegorical or otherwise not accurate as a history book without discrediting scripture, and therefor God. I like to call this bible abuse. It is a form of beliefism wherein a person’s faith is in scriptures rather than in the living God. Now, I know the verses from Hebrews (“The word of God is living and active and sharper than any two edged sword” Hebrews 4:12). And I do know what they’re saying here. However, I still wonder about a Christian author who attributes understanding, feelings and such to a book – even the bible. It seems to me that it would be more accurate, and more helpful for the proper mindset of the reader to say, “God understands this and that is why He put it in His word”? Maybe I’m nitpicking here. Professors at Dallas Theological Seminary published a position paper Tuesday eliminating the concept of “God” and/or “Lord” from Christian worship and replacing it with worship of the Bible only. The step had been anticipated for several years and was considered a formality within the actual “Bible only” movement . . .
A friend of mine believes that many American Christians have made an idol of the Bible.